Salvatore Bellomo, who most notably wrestled for WWE and ECW, has passed away at the age of 67 years old. Originally from Hornu, Belgium but of Italian descent, Bellomo began his wrestling career in 1974 in Canada. He wrestled under various ring names of Italian derivation before settling on Bellomo. He started out portraying a mild-mannered, clean-cut fan favorite with respectable technical wrestling skill. In later years, Bellomo would portray a wildman character in the ring, thought to be unpredictable and/or brutal. After Vince McMahon acquired Stampede Wrestling and Maple Leaf Wrestling, Bellamo began working for WWE in 1982 — then known as World Wrestling Federation. He gained moderate success early on as he won a number of matches. Bellomo also wrestled Bob Backlund at the Philadelphia Spectrum on August 4, 1984, jobbing to Backlund in what would be Backlund’s final WWF match of the decade. From this point on, Bellomo was most recognizable as a jobber on WWF television programs. He often lost to heels, including Bobby “The Brain” Heenan in a match at Madison Square Garden in November 1984. Being the fall guy was not necessarily as bad as it sounds as Bellomo got to work with the biggest names in the WWF at the time in some of the biggest venues. During this time in the WWF, his greatest claim to fame was filling in for his injured friend, Junkyard Dog, on an in-ring edition of “Piper’s Pit” in December 1984. As a guest of “Rowdy” Roddy Piper, Bellomo was the target of severe verbal barbs from both Piper and his ally, “Mr. Wonderful” Paul Orndorff. After the verbal attack turned physical, the injured JYD dragged himself to the ring to fend off Piper and Orndorff. After leaving the WWF in 1987, he returned to Europe, where he joined Catch Wrestling Association (CWA) in Belgium. Wrestling as Tino Bellomo he was able to show off his in-ring ability a lot more. He wrestled for the CWA from 1988 until the early 1990s, at which point he made his return to North America. By the early 1990s, he had grown his hair and beard out, becoming “Wildman” Salvatore Bellomo. He began to use his power and size more than his mat technician skills. Bellomo wrestled for ECW from 1992 through 1994, departing just a few months before Paul Heyman rebranded Eastern Championship Wrestling as Extreme Championship Wrestling. While Bellomo didn’t achieve much success in ECW, he has the distinction of competing in the first-ever match for the ECW World Heavyweight Championship. On April 25, 1992, Jimmy Snuka beat Bellomo in a tournament final to become the first ECW World Heavyweight Champion. Bellomo also became a mentor to The Sandman. Bellomo returned to ECW in 1996 for a brief program with J.T. Smith before departing the promotion for good. He continued wrestling on the U.S. independent circuit through the early 2000s before returning to his native Belgium. He continued wrestling regularly in Europe until November 2006, at which point he retired from the ring. His retirement didn’t last long as he returned to the ring a few months later, albeit on a sporadic basis. He remained active in the business until his death, working as both a trainer and occasional wrestler. According to Cagematch.net, he wrestled as recently as last October, where he lost a six-man tag team match in Germany. 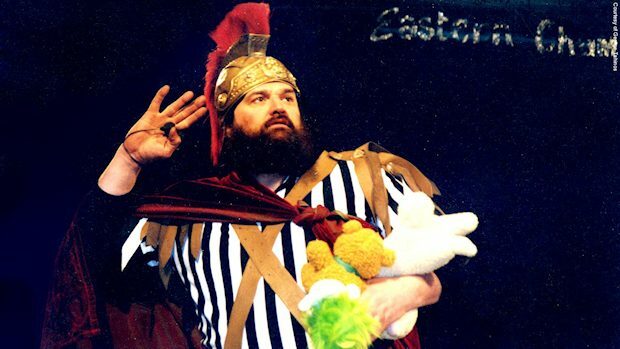 Bellomo’s death comes one week after former WWF wrestler Les Thornton died. They faced off three times in 1985, with Thornton winning twice and Bellomo winning once via DQ.